I have designed an extrusion die for some Slant 6 roller rockers, so making one for these small 6 rockers wouldn't be a problem. Just need a fairly consistent demand to pull the trigger on doing one for them. everybody except those who rebuild total stock engines wants custom rockers. I don't want to step on anybodys toes as CHRIST would not be in it . but I want 1.65 rockers that are adjustable preferably irn or alum don't really matter also but I,ve brought serveral items into production for different applications for 3 decades. I,am retired now and really don't want to go thru this for several reasons but I,am gonna because I want a set for my engine. pushrods isn't a problem, hard chrome rocker shafts isn't a problem. theres gotta be a real close if not right on match to the rockers . example fe rockers,292-312 rockers etc. as far as cams if you,ve got a good core isky will regrind your to your spec,s and you,ll know your cam isn't china junk. that's my plan on it. I guess 255 pistons so I don't have to cut head or block down /or not as much. Yella Terra was the manufacturer of those I think. You might have to look to the Aussies for them now. What you want is full roller rockers the other at the fulcrum. One drawback of the yella-terra.s are the size of the fastener that bolts them to the mounting bar. A real plus would be 7/16" fasteners. SI industries will make a longer valve to allow the use of 1.7" installed height valve springs, so valve lifts can exceed .525" valve lifts & allow valve springs to allow the higher & faster rate of lift, but still maintaining short duration to enhance low & mid-range power. I'm sure you'll get enough responses to make it worth your while. And I know that with you background, you'll get good economies of scale. I'd go for 1.73 or 1.80:1 if it were me. Its just advice, not manadatory. But it is based on 38 years of research which I started when I was seven. (I had a father with a 78 hp 138 six, and a 145 hp 225 six, and a grandad with a 165 hp 245 six. I got together all the info on the engines, and started a quest for I6 enlightenment). I'd like to add that just recently, I found quite a number of mistakes in engine flow analysis, and some wrong details regards to what works for our engines, but basically I've been right for the wrong reasons on what works with the log head small sixes as a consequence. Basically, the 1976-1987 cross flow and 1988-1998 Single over head cam 200/3.2 and 250/3.9-4.0 engine like 270 degree at lash and above cams with as much lift you can get in between the pistons and head. That's 530 to 560 thou safely. With proper induction (4-bbl or efi), you then get easy 265 hp as a 200/3.2, and 315 hp with a 250/3.9-4.0. Only these cams get any reasonable performance gain over the compromise less than 270 degree cams. Witn more aggressive cams in the over 300 degree range, power can go up to 300 and 350 hp respectively. The less adept breathing of the non cross flow log head can use a 275 or greater cam with 470 to 490 thou lift, obviously limited by valve to piston contact, and they need it to give even 235 and 280 respectively for 3.126 and 3.91 stroke 200/250 engines(4-bbl or efi). With 310 degree cams, you get a flatline due to induction restrictions, but its possiable to get into the 265 to 315 hp range with a low peak flow head if you do some simple carb repositioning. .
At those durations, peak lifts, those 1.73 or 1.8:1 rockers show a good increase in off the seat lift rate, and really allow better hydraulic roller cams to be used as well. Biggest performance boosts come from proper induction, and the non cross flow can really flow really well if you can grind out the inlet runners, and remove the big bends that single carb instillations produce. There is so much scope for the non crossflow engine if the intake fuel distribution is taken care of. The sawn off log intake flows of Fast64ranchero, JTturbo, and 67Straightsix have been matched by Paul Knott with his 280 hp 170 small log six. So 165 to 185 cfm at 28"H20 is enough to make well over 280 hp easily, and with the right intake mods, a 1.73:1 rocker ratio will do well for even a 200 six. You can follow the normal process of copying the Australian practice, but the work Dave Bennett at Perfectune did it was to consolidate the engineering parts, so the 1.65:1 rocker is a Ford V8 part reworked for the non cross flow six. It uses GM Holden 186S pushrods, and a number of parts to make it all work. As such, it is a compromise. When used on the FE, the same rockers dial in as a 1.73:1 rocker ratio roller. From a purely simplistic angle, the design team that made the Falcon engine a 1.5:1 lever arm rocker could have just as easily made it 1.73:1 just like the 1958 FE (and later Boss 302/ Ford 335/ Big Block 385 engines). That small six team was bascially the same team that designed the 1958 FE. To make 1.65:1 in 2015 lookes a little short sighted when we are now aware of just how much the engine needs more lift. The rocker shaft is unsupported for the exhaust valves, and could ideally use a drag race style FE style rocker solution. There are 1.8 and 1.9 rockers as well, used in canted valve OHV V8 small block race engines. And the valves could be made usefully longer (5.16" tall verses 4.78") to use modern conical valve springs. The whole pre cross flow head is in need of work to drag it kicking and screamng into the 21st century. And roller lifters are an easy inclusion with just a Mike1157 style block modification. The way Mike did it was to drill 2" holes, but you can fly cut a bunch of horizontal slots with much less impact on the block, and make space for the lifter ties or 5.0 EFI style spiders. Traded off against the cost of an intake, an alloy head, and the carb limitations of one source of air fuel dispersal, the log head can save you a bunch. Proper 1.73:1 rocker arms, a roller cam, lifters, and the bare mimum to get it into the tight non cross flow block, a high rev kit will awaken the non cross flow. Following the historical rules of an ex Ferrari Italian engineer who later did in line sixes after V12's, I've gotten the log head intake flowing the way it should with just 4-bbls of carburation. 2) General Motors Holden 1968-1970 model year (Monaro/Kingswood/ToronaGTR) 186S pushrods. 3) The system uses a variation on the early adjustable valve gear. 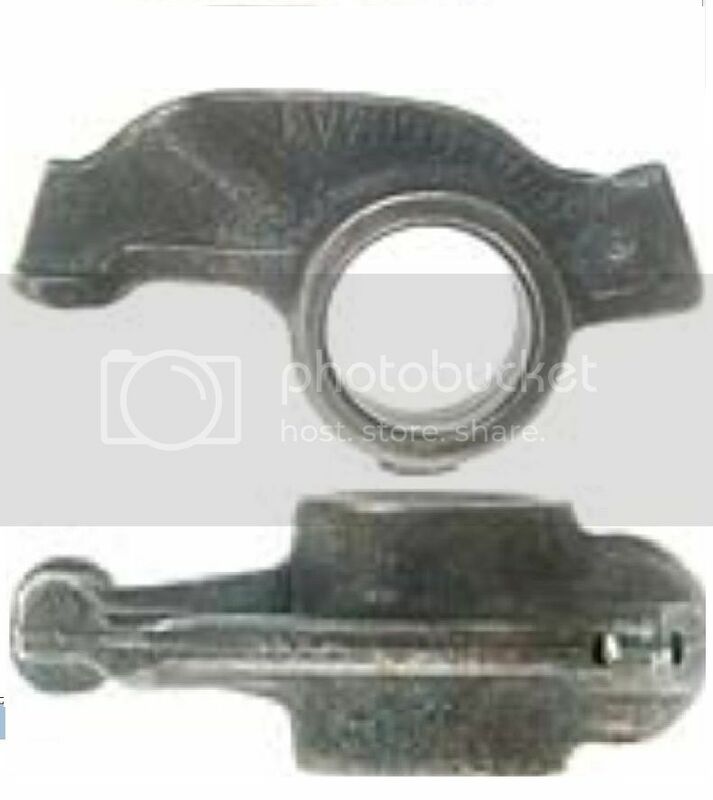 4) Since its an extrusion, its not as strong as a traditional steel rocker arm can be, and there is evidence that roller tips are of no real benfit. Look at Chevy's modern small block...they don't have roller tip rockers, but do have long rocker ratios. If you wanna copy backward late 60's thinking, go for it. For the cost, you could design proper 100% US components for a lot less, and get a 1.73:1 rocker ratio. If you want to use early 80's tech, and late 60's parts on a 50's designed engine to beat all the work that Ford Australia overturned with a 1.73:1 rocker ratio 1976 cross flow, that's your business. I'm telling you that on an engine that breaths as badly as the 250 does, you need every thousanths of rocker arm movment and duration. In the case of removing 125 thou of lift by putting in a zero deck 8 cc dish 255 piston...that won't help you amke power. I'd presonally use the hugh 1/8" piston short fall for more valve lift, and forget about ideal zero deck heads. Do you want a proper 560 thou potential valve lift with 1.73:1 rockers that needs only 325 lift at the lobe, or 490 thou lift that almost hits your pistons, and too much compression? You need more lift, more duration, more piston to valve clearance, and a more constructive approach to building power. Ford in Australia was using 1.73;1 rocker ratio sixes in 1976, and longer conrods in 1998, and that's why a little 4 liter engine can shut down a good 5.0. In 1969, little 245, 250 and 265 Hemi engines with 1.7:1 rocker ratios were taking out 302's and 351's for 11 years in sedan racing. x - do you know what these are? Last edited by JackFish on Fri Dec 25, 2015 6:10 pm, edited 1 time in total. know but I would really like to ? sbf that are converted to shaft ? I,d like to find out as quickly as possible as my rocker guy is fixing to start on a set of 1.6 iron adjustables for me next week. really k=like that top engine design,well thought out. got any pictures of the 2v conversion ? and what top 2 groove pulley is on it ?? that's just the way I,d like to set my engine up including the headers. mind sharing where you got them. I,ve looked at a bunch but yours is exactly what I was looking for. I got the photos off the Classic Inlines website. I think the top photo is a guy that was on here for a while from down under somewhere. JackFish wrote: x - do you know what these are? MustangGeezer and CobraSix used the white box supplier to produce Classic Inlines Roller Tipped 1.6 Rockers, a US made version based on the ST2014 Yella Terra 5/16" rocker hard dimensions, as per thinman56 and others here. Might have been made by Scorpion, judging by the anadised color. Harland Sharpe was orange, BRC (Brooks Racing Components) roller rockers were like Crane or Erson , I think. LOOKS to me that a modified sbf rocker will will work. no trunion,no poly lock, jus the adjuster and jam nut on pushrod end. anyways I "should have a prototype setup in a couple weeks. not roller though. and the advantage of the 7.3 to one was a "longer opening time" of each exhaust and intake valve than stock? With any system (i know human systems better than machine systems) I've learned - you change one thing, gotta change some others. So would you need longer c.rods and push rods to achieve this "longer opening time". Ya can't just slap these things on I imagine. This might be a good place/time for me to repeat my humble request: Anyone know a good high school auto shop manual that could help me with an overview/some automotive theory? The blue ones are RAS, rocker arm specialty's ,not sure if still in business. Sold as 1.6. I do not believe that you can have a piston to valve problem, the valves are not tipped a lot. If you did a small valve relief would fix that, but I do not think it would ever be necessary. AK Miller told me that stock rockers were 1.43 but I have never checked to know if true. yes my rocker arm guy told me stock was 1.46 off the top of his head so going to a true 1.60 will increase lift by about .045 which isn't bad. having custom aluminum roller rockers will be pricey because volume isn't there to bring cost down. I,ll post more when info comes to me. a prototype set is being made for me. he said give him about a week. rockers and matching pushrods. does anybody need a set of stock non adjustable that only have 57 k on them ? FYI, RAS is out of business but it looks like a bunch of the workers banded up and reformed. Here is a link to their Ford stuff. I've sent them an email asking for cost, achievable ratios, and typical turn around time. They do require a core, so it would appear offhand that they don't just have stock sitting on the shelf. I'll let everyone know what I hear back. I,ve been told jeep rockers work but which jeep I don't know "yet"
cr_bobcat wrote: FYI, RAS is out of business but it looks like a bunch of the workers banded up and reformed. Here is a link to their Ford stuff. I've sent them an email asking for cost, achievable ratios, and typical turn around time. They do require a core, so it would appear offhand that they don't just have stock sitting on the shelf. I'll let everyone know what I hear back. Rocker ratio info in totallity is hard to come by, but call numbers are everywhere. See approx page 806 of this catalogue for Jeep rockers. Ford rockers abound. The FE vs Small Six rockers are a good first start...remeber, you have space for a FE rocker to fit on a small six shaft if you are able to adjust the lever arm right. Melling MR-859 (ROCKER) Sealed Power # R814 (ROCKER). It's re-engineered for about 748 thou diameter on the small six. Melling MR-877 (ROCKER). Sealed Power # R810 (ROCKER). Pretty sure they have the same hard dimensions aside from the diameter. Interesting info. I have never had the extra pocket change to purchase a different rocker set. Likely with Mike's death and the apparent death of Classic Inlines, I am done with inline 6 Ford power. 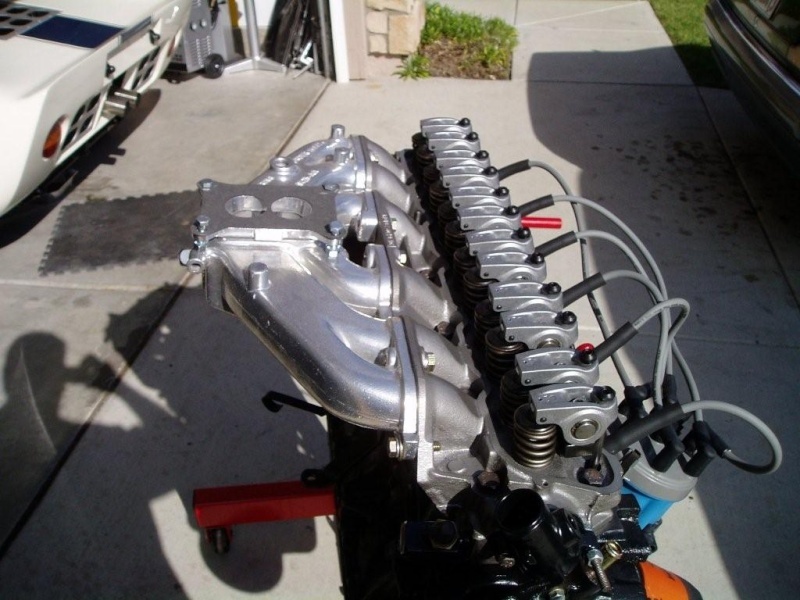 "….I am done with inline 6 Ford power." Still tryin to gather what we can on the sm parts/vendors. The price for the H/R is $399.00 + S/H Exchange. 400 dollarydoos is a bit on the steep side so I will have to think it over. I have stock ratio rockers that are fresh NOS so the 1.5 make no sense in my situation. I'm interested in knowing what you guy comes back with for a price point. On the A series 1275 cc engines, offset bushes on the steel rocker shaft were made to take the rocker arm from 1.18:1 to 1.31:1. 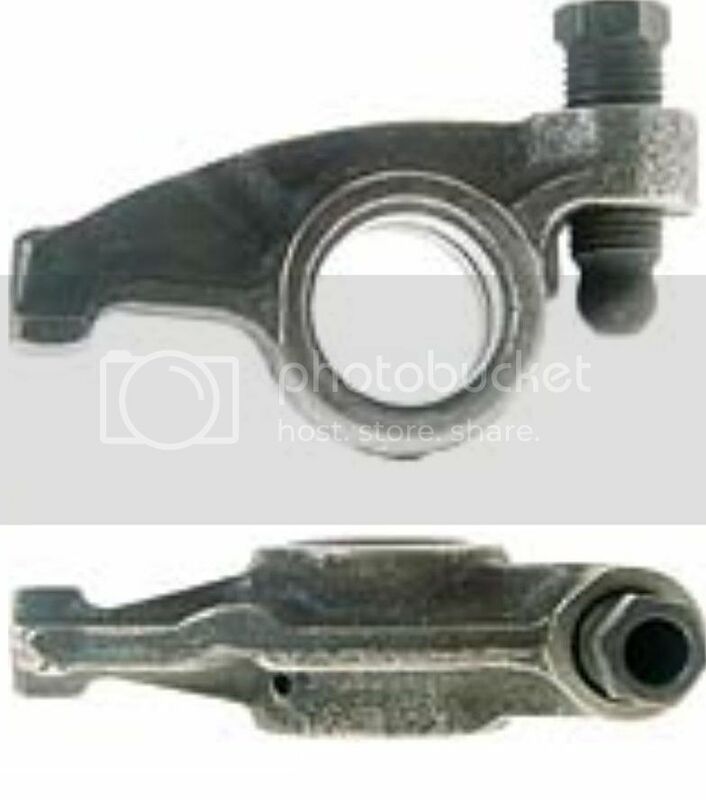 You'd be better using a narrowed FE rocker arm, and use custom made Offset bushes on a downsized rocker shaft. You can easily get another 12% rocker ratio from some stock 1.5:1's to get 1.69:1. But if you use machine down (narrowed) 1.73:1 FE hydraulics, you can get 1.65 on the small six, and then go up to almost 1.85:1,the same as an OHC Falcon 4.0. I tested S rockers, pressed steel rockers, and the late sintered ones. I found the S ones gave 1.16:1, pressed steel 1.21:1, and sintered 1.18:1. All were measured on the same 12G940 head, with an RE13 cam (0.290" lobe lift) fitted. I like the pressed steel (round pad) ones, with 0.44" offset bushes in I can get them up to 1.31:1 ratio. And their pads are harder than the S rockers. The oval pad 1275 ones with the same offset bushes, I got 1.35:1. Simon K has a set in his S.
No one in there right mind would spend a pound to get an ounce. No, hang on, um, what I ment was probably "spend ounce money for no bang for the buck". Ford started with a serious 1.76:1 solid lifter ratio, any I6 builder stuck with 1.5:1 ratios should do the same. That's only $180-$300 for the rocker arm set. Yella Terra's will run you over $500. At $30 to $50 per rocker arm X 12 equals $360 to $600. The problem with having an interest in "off brand" or "low interest" niches like this is that even a product like this won't even get the attention of companies like Scorpion or Harland Sharp even if you wanted 100 sets of them. The Slant 6 guys approached one of the companies with a 100 set opening order and they said "Not interested, don't call back". $300-$600 for a set of rockers that nobody will make and stock on the shelf is cheap! If you want a set of $99 roller rockers, build a SBC or a SBF. I know the math that's why I,am going 1.6 stock ford rockers. should have them soon. I thought someone was doing some roller rockers for you.